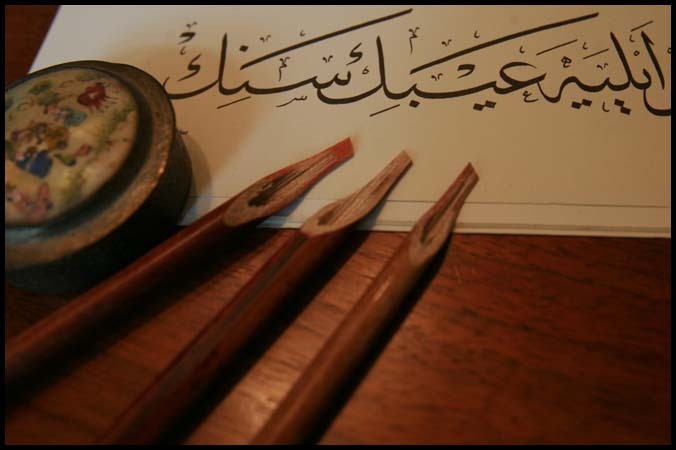 The Kamish (reed) pen is the backbone of Arabic calligraphy. Kamish pens have been used by Arab, Turkish, and Iranian calligraphers as the pen of choice for more than 500 years. It is made from reeds that grow along rivers. However, there is a lengthy process of “curing” the pen to make it ready for use by the calligrapher. These pens are imported from Turkey and are made specifically for Arabic and Islamic calligraphy. *Note: If you are interested in writing small text or harekat, try the Handam pen! We also offer all three sizes of Kamish pen in a decorative gold-speckled boxed set. To view a video of the Kamish pen writing, click the link below.